825th Hamburg Port Anniversary - Welcome aboard in 2014! The Hamburg Port Anniversary celebrations on the River Elbe will bring the majesty of tall ships, and the luxury of cruise vessels. The event is attracting more attention that ever, which is testament to the fact that the first cruise ship was built in Hamburg for the Hamburg America Line and was launched on June 29, 1900. The ship was christened The Prinzessin Victoria Luise it was accidentally grounded off in Jamaica on the 16th of December 1906.The German Cruise Line market is now booming with the rise of AIDA Cruises (usually a strong sponsor of the Hamburg Port Anniversary event) and the recent progress of Mein Schiff. Without question this is the greatest port festival in the world and will be celebrated for 3 long vibrant day. 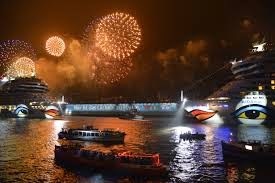 All activities including a magnificent Fireworks and lighting display will take place at the Port of Hamburg and its famous Landing Stage (Landungsbrücken).